More than four lives a year have been saved since the introduction of 20mph zones across Bristol, research by the University of the West of England (UWE) has found. Average speeds on roads where the 20mph limit was introduced fell by a "statistically significant" 2.7mph since 2014. About 170 injuries were prevented, saving £15m a year, the report added. It said the policy was now a "model for cities across the world". More than 36 million vehicle movements were analysed by the UWE team, following the roll-out of 20mph zones in 2014. While the report confirms support for 20mph zones is high, there is "cynicism" about lack of police enforcement and compliance from "other drivers". It suggests that the policy has seen a doubling of the number of people who now find it "sometimes acceptable" to speed on residential roads. Lead author of the Brite report Dr Pilkington said the findings were "very promising" for the city and for 20mph speed limits in general. "It offers a model for other towns and cities across the world, who are seeking to reduce traffic speeds, cut road traffic casualties, and promote community health and wellbeing," he said. 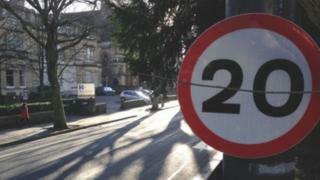 Bristol City Council said it would carry out a review of the 20mph policy in the Spring. Cllr Mhairi Threlfall, cabinet member for transport, said: "It is early days but the results are a positive indication that lower speeds are making it safer to get around in Bristol."